Note: our special birthday gift program has come to an end. Thank you for participating, and stay tuned to our blog to catch much more advantageous offers, lots of interesting articles and interviews with e-Commerce experts. Six years ago a vague and unclear idea was born in Cart2Cart founder’s mind. He wasn’t certain how to apply it at first, and, probably, didn’t expect its future to be very bright. But, nevertheless, he kept proceeding with it. 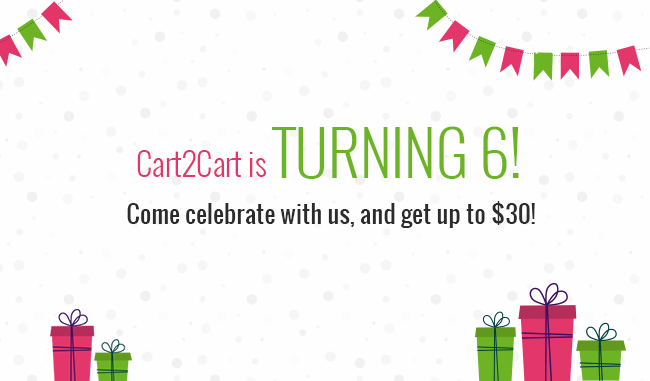 Now, Cart2Cart is 6! It has completed a plethora of successful migrations and helped thousands of e-merchants to improve their businesses. And that, in our opinion, is a vivid example of how powerful the human thought can be. But it isn’t just the founder who’s responsible for our success, nor is it the staff - Cart2Cart would be nothing without you, our clients. You believed in us for half a dozen years, and, today, we’d like to give you a present to express our appreciation. Choose one of six gifts offered by Cart2Cart, and get up to $30! Our birthday gifts program will be active from May 28 to June 5, so hurry up and take a chance in the lottery, where your winning is guaranteed! Once again, thank you for supporting us and good luck with your online business. We love you!